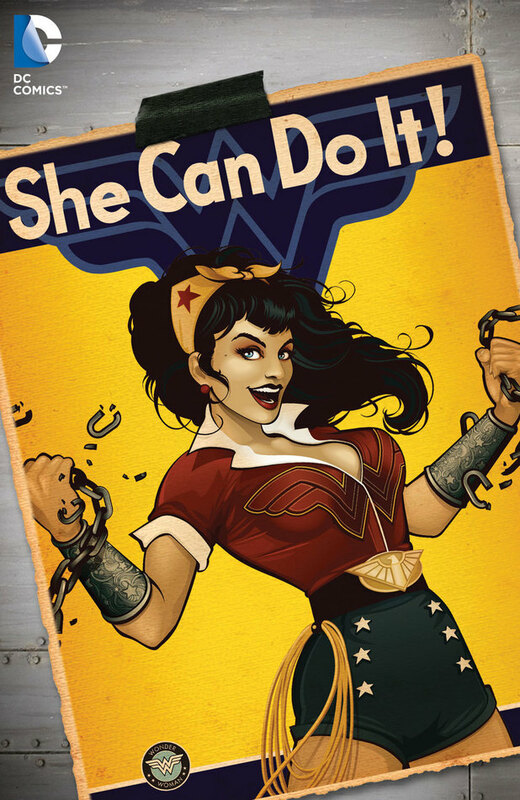 ‘ iconic female characters have been rendered in classic 1940s and ’50s pin-up style as part of the publisher’s Bombshell Variant promotion. Artist Ant Lucia’s retro takes on Wonder Woman, Catwoman and Poison Ivy have been revealed ahead of their release in June. DC Collectibles’ Bombshell Statue line served as the inspiration for the Bombshell covers. BOSTON (WCVB/CNN) – Boston is enlisting the aid of some four-legged helpers to combat the city’s nastiest weed problems. They’re out to make Boston a nicer place to live, one chomp at a time. “We actually have goats right now at this very moment eating poison ivy and hopefully this will open up this space to be more accessible green area,” interim parks Commissioner Chris Cook said. “Goatscaping” is underway by the Neponset River in Hyde Park. It’s an area Boston city maintenance groups and volunteers can’t access because it’s overrun by poison ivy. 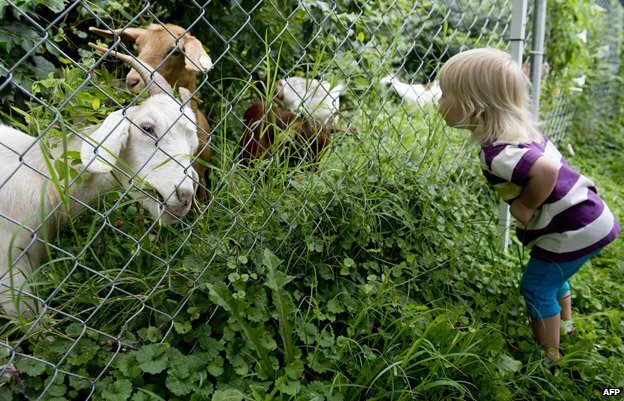 Apparently the poison ivy is a delicacy for the four goats who just arrived to the park. The “goatscaping” will go on for eight weeks, and they have a lot of work to do. Grant money will cover the $3,000 costs, and teens in the Hyde Park Green Team helped convince Boston’s mayor it was a good idea. 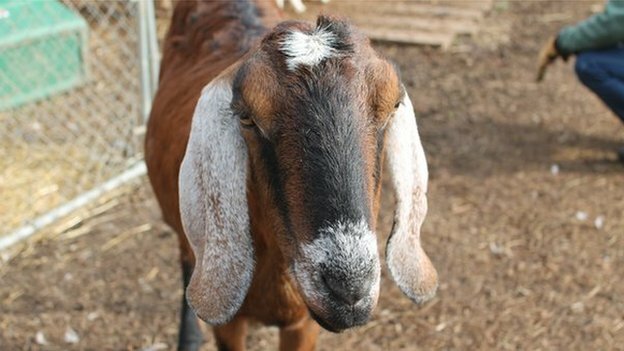 “We proposed our idea of having goats and he thought it was pretty cool b/c it was the first time in Boston,” Jolanda Douyon of the Hyde Park Green Team said. The Green Team will help care for the four-legged helpers during their stay at the West Street Urban Wild. “The ‘goatscaping’ company will fence in a half-acre at a time with an electrified fence that is solar powered. It’s not harmful to humans. It’s really meant to keep coyotes out and goats in,” said Patricia Alverez of Southwest Boston Community Development Corporation. 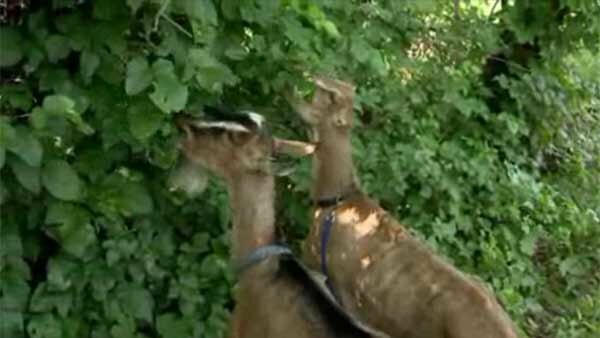 The city says it’s fine for the public to view the goats, but don’t pet them – they’re covered in poison ivy oils. 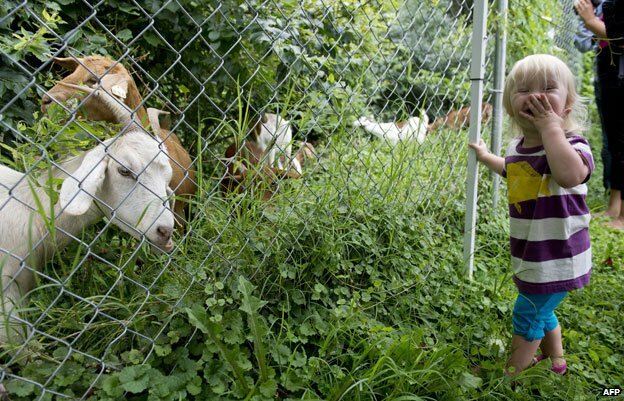 According to the Boston Globe, the $2,800 cost to rent the goats is being covered by grants. Copyright 2014 WCVB via CNN. All rights reserved. Poison ivy grows on a tree in the Lincoln Woods off West Pierrepont Avenue. This photo was taken two weeks ago. Poison ivy growing in the Lincoln Woods has once again posed a dilemma for volunteers and officials looking to turn the property into an educational park. Construction of pathways and benches are presently on hold to address the vegetation, as the Shade Tree Committee and borough discuss how to move forward. The volunteer Shade Tree Committee and Lincoln School community have been working since 2010 to turn the 1.8-acre Lincoln Woods, located behind the Lincoln School between West Pierrepont and Vreeland avenues, into an outdoor learning center for the nearby Lincoln School. The property was designated a permanent open space Green Acres property in 1985. 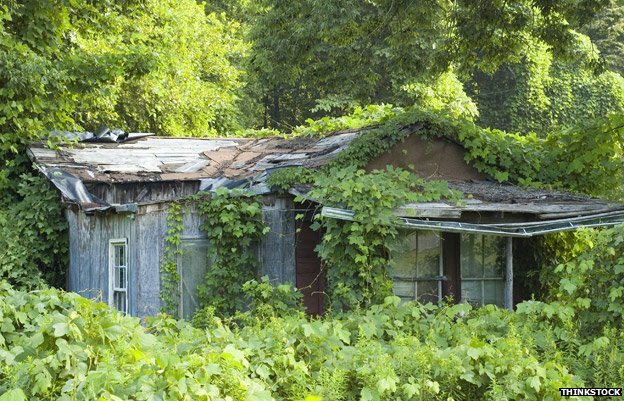 But the property has been over run with poison ivy. 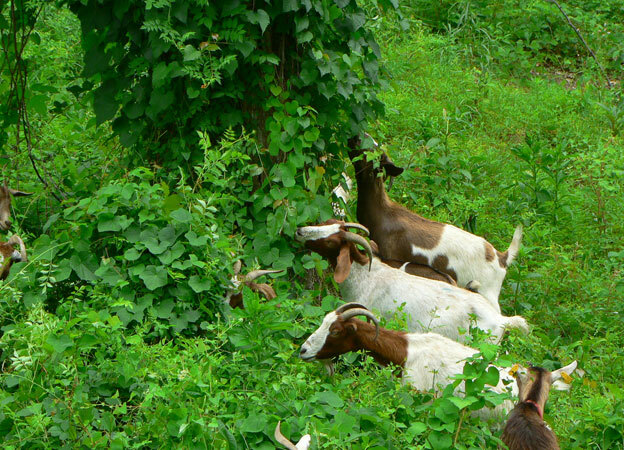 Aiming for a less expensive option that would not involve widespread herbicide treatment, goats were deployed to the site in June 2013 and October 2012 to chomp on poison ivy and other growth. 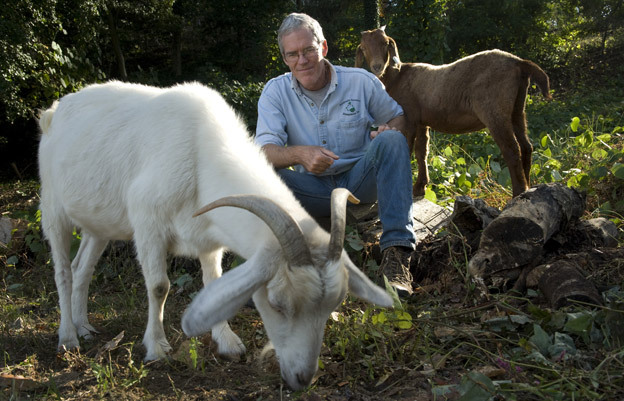 Lawrence Cihanek, owner of Green Goats in Rhinebeck, N.Y., and his bearded, hungry herd of 15 were hired to take out the weeds, clearing a good portion of the property. According to borough officials at the time, Rutherford paid $3,420 for each visit for the animals and fencing, paid for through fundraising by the school. Seasons have come and gone since, but the poison ivy has returned. The next phase would involve construction of a pathway through the property. 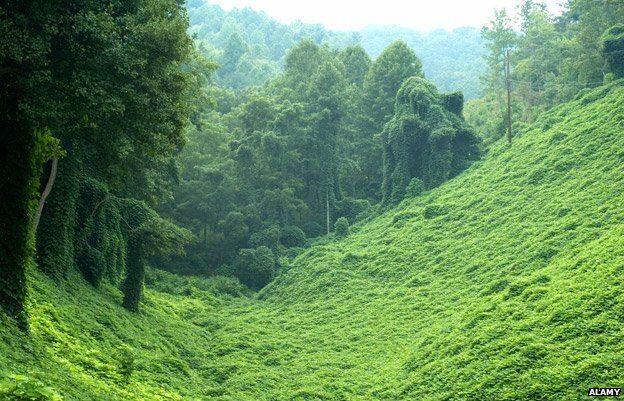 However, as council members noted at their most recent meeting, the site is presently overgrown with poison ivy. A trail that would run through the woods with a wooden boardwalk leading over a swampy patch of land near Carmita Avenue, some small clearings with logs for benches, informational signs identifying local flora and even a small semi-circle for outdoor lessons have been proposed. Site design was provided by a landscape designer through the New Jersey Meadowlands Commission (NJMC). In his opinion, path work cannot begin until the poison ivy is cleared, Shade Tree Committee and DPW council liaison Jack Manzo said. On June 12, a lawn care contractor working for the borough inspected the site. Manzo said it’s possible the work would be done over the course of the summer and likely done in-house by the Public Works Department. In preparation for the next phase of the Lincoln Woods Project, the borough advertised and received bids for pending work. The highest was submitted by Atlas Tree Service at $20,800, the median bid by Sunset Ridge Landscaping at $16,500 and the lowest by Schule Landscaping at $8,800. A memo from the purchasing department indicated the lowest bidder Schule Landscaping attended a pre-quote meeting on May 9 and is aware of the work specification and project schedule. As Manzo explained, the phase would involve installation of two winding, six-foot wide paths covered in woodchips that will meet towards the center with two different clearings with log benches. Access gates for the public and school will be included. Due to the uncertainty raised by the poison ivy conditions, the council has yet to award a contract. Bid specs recently advertised did include clearing of the ivy for the 6-foot-wide trails and border areas, for the safety of residents. The committee intends to ask the borough to spray herbicides between two and three times a year to eventually bring the ivy under control, a recommendation made by the NJMC and Shade Tree Department, Hsu said. The Shade Tree Committee is comfortable with allowing the Department of Public Works to treat the site prior to the trail work starting, granted the next phase is only delayed a few weeks, Hsu said. “We were hoping to have the trail in by summer, but we’d like to have something since a lot of people donated to this project, and we want them to be able to enjoy the property,” Hsu said. Hsu is optimistic that the borough and committee can decide on the next step this week during their scheduled meeting, expressing optimism in the renewed communication due to Manzo’s attendance at their meetings. The previous liaison did not attend, she said. Progress was also made in spring through hazard tree removal – ones at risk of falling and others that were infested with poison ivy, Hsu said. Donations by the public and a state grant are planned to finance Lincoln Woods. 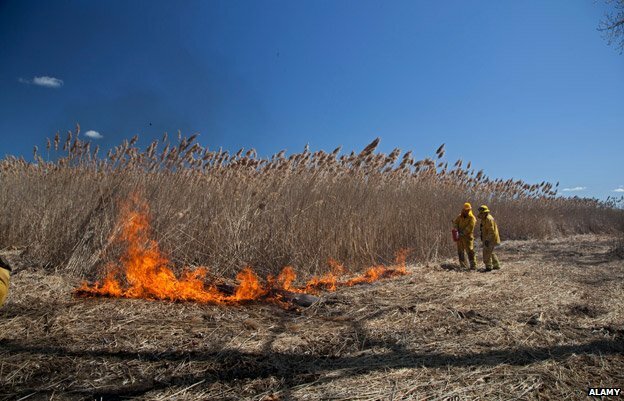 The New Jersey Department of Environmental Protection awarded a Green Acres grant for the Lincoln Woods and Memorial Field projects combined in early 2013. Rutherford falls into our Densely Populated Municipality category, and therefore, is eligible for a 25 percent grant and up to a 75 percent loan, with a total estimate for both projects combined at $1.02 million, explained NJDEP spokesperson Robert Considine. The grant itself came to $256,000, and a loan of $194,000 was approved by the state. In October 2013, the Rutherford Council passed a bond ordinance allocating $256,000 in general bonds for improvements at Memorial Field and Lincoln Woods together. A donation of about $15,000 was made this spring by the Rutherford Education Foundation for the woods project, and over the last few years, funding has also been raised by the Lincoln School PTA. The Green Acres grant has yet to change hands from the state to Rutherford. In quiet Reading, Vt., home to only about 700 people, the entire fifth-grade class, just six students this year, can fit around two small tables. Friday, when New England Cable News stopped in, the kids were focusing on math and Spanish, despite the distractions of a nice day outside and a visit from their unofficial school mascots. “They’re really friendly,” beamed student Hayley Mullins, 10. Happy, Sadie, and Izzy are a talkative trio of boer goats who come to the school to work at chewing down brush and weeds. “It was, I guess, a mess,” said fifth grader Nick Bishop, 10, remembering what the field behind the playground looked like last year. The field, Bishop recalled, was a jungle of poison ivy and other scraggly plant life. The poison ivy, in particular, would always threaten to ruin everyone’s fun when a wayward ball would roll into it, the class said. That is, until the three goats first showed up in October of 2012 to mow down the irritating plant. “No one gets a rash and has to stay home from school; from learning,” said Nevaeh Sullivan, an 11-year-old fifth grader. The project has even earned the school some big bragging rights. The U.S. Dept. of Education named the Reading Elementary School one of its 64 “Green Ribbon Schools” across the country for 2013. State education agencies nominate schools to their federal counterparts, and recipients are praised for efforts to reduce their environmental footprints. This year’s list of recipients also includes two other Vermont schools: the St. Albans City Elementary School and the Shelburne Community School. In addition to the “eco-goats,” the elementary schoolers in Reading compost, recycle, study conservation, eat food grown on school grounds or by nearby farmers, and promote sustainability. “Our hope is that others will be able to follow the example we’re trying to set as a Green Ribbon School, and do it in their own way,” said Lou LaFasciano, the principal of the Reading Elementary School.